Environmental conservation is a team sport. Who you collaborate with, your ability to share and integrate information, and the quality of the data you base your decisions on determine how far and how fast you can go. All too often, conservationists working on the ground have limited access to scientific discoveries, and scientists in turn have difficulty connecting with the practitioners who most need their data. Scientists and conservation practitioners need better ways to connect, collaborate, and share their collective knowledge. This challenge inspired Wilburforce Foundation and the Conservation Biology Institute (CBI), supported by early contributions from Rhiza Labs and ESRI, to collaborate on a new approach to gathering and sharing conservation data: Data Basin. 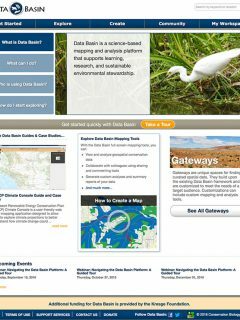 A core service of the Conservation Biology Institute, Data Basin is an open access, online platform that allows anyone involved in environmental stewardship—from scientists and governments to foundations, teachers, or the general public—to share cutting edge scientific data and maps that facilitate more effective environmental stewardship. Unlike traditional mapping tools, Data Basin was designed to offer easy-access integration and collaboration tools for a non-GIS savvy audience. Since it launched in 2009, Data Basin has significantly reduced the amount of time and investment needed to find credible scientific data, while expanding users’ capacity for visualizing, communicating and collaborating. Perhaps the most powerful contribution Data Basin provides is helping partners share data to collaborate more effectively in their conservation efforts. Through Data Basin, users can form groups to share information on a particular region, animal or area of study and find potential partners from across the world. To date there are more than 670 groups on Data Basin, ranging from the U.S. Fish and Wildlife Service to Woodland caribou conservation. For collaborative efforts needing a customized version of Data Basin, the Conservation Biology Institute will design and host curated portals, or gateways, for their particular datasets. For example, CBI has developed multiple gateways for the Landscape Conservation Collaboratives (LCCs), a set of 22 partnerships bringing together governmental and non-governmental stakeholders to address conservation challenges in their specific regions, from the Desert to the Great Basin to the North Pacific. For many of these partnerships, a wide range of data is available in their regions, but it is dispersed throughout various agencies. The gateways gather all the data in a central location, which all partners—whether they are GIS experts or casual users—can use to share region-specific data sets, create maps, build galleries or join collaborative groups focused on specific projects. The North Pacific LCC Conservation Planning Atlas, as an example, enables partners to create and share maps on everything from California burn areas to important bird areas in Washington and Oregon, and to create galleries on topics ranging from the effects of climate change in the Pacific Northwest to the protection of marine resources along the North Pacific’s 38,000 miles of coastline. In June of 2016 Data Basin welcomed its 15,000th user. Future plans include new tools that will allow multiple people to edit and create data, and mobile applications that will enable researchers to collect data in the field and immediately be able to get into those data sets and create visualizations. Data Basin helps ensure the best conservation minds and stakeholders—whoever they are—can come together in a cost-effective, efficient manner, from anywhere, anytime. Data Basin is managed by the Conservation Biology Institute, with funding from the Wilburforce and Kresge Foundations. For more information on Data Basin, see databasin.org.